The developed technologies will benefit the accomplishment of more regular tasks of inspection and maintenance, without increasing costs or risks. Environmental improvements will arise owing to the better asset management that results from these more efficient inspection and maintenance procedures. The deployment in GPS-denied conditions, the safe navigation in presence of obstacles, joint to increased manipulations capabilities (including contact inspection) are some of the issues to address the inspection and maintenance tasks on the three real-life scenarios. DREAM has been granted with a budget of 969k € under the spanish programme FEDER INTERCONNECTA 2018 by CDTI. The INSPECTOR consortium is made up two large enterprises (TSK and COMSA), three medium sized enterprises (PREDITEC, TELICE, DIAGNOSTIQA) and three small companies (DRONETOOLS, SYLTEC and TRESCA). Its funded under the Spanish initiative Programa CIEN with a budget of 7,1M € and its duration is 48 months. The ARM-EXTEND project proposes the development of the first robotic manipulation system with aerial and ground locomotion capabilities in an industrial environment and the first specifically designed for inspection and maintenance purposes in locations with very difficult access. The system will perform works at height that today are carried out manually with important risks of the persons and high operational costs. This system will be able to fly near to the intervention location, land on very constrained surfaces, such as pipes, and roll on the surface performing inspection and maintenance tasks and reaching sites not directly accessible by the flying system. Thus, it will be possible to perform manipulation task with a fixed base overcoming the accuracy limitations of manipulation with a floating base and decreasing the energy consumption allowing to increase the duration of the missions, which is very constrained in aerial manipulation. – Development of the first aerial robotic manipulator with both aerial and ground locomotion capabilities increasing accuracy in manipulation (millimiter accuracy) and improving drastically the duration of the missions of the aerial manipulation systems based on multi-rotor which is only few minutes. The rotary wing configuration will have multiple rotors with tilted axis (vectorized thrust) to provide more agility overcoming the limitation of conventional multi-rotor platforms with parallel axis. – Develop autonomous landing on pipes and other constrained surfaces by using 3D environment perception system with both visual and laser sensors. The landing system will benefit from the agility of the multi-rotor with tilted axis. – Manipulation by using light robotic arms overcoming the accuracy and dexterity that can be achieved while the robot is flying without any contact point. Thus, the manipulator will be able to perform wall tickness measurements and installation of permanent sensors. – Collaborate with other aerial robots in inspection and maintenance activities. Thus, a fleet of aerial robotic inspectors will be able to detect and localise leaks and determine the locations to be inspected by the aerial robotic manipulator to perform wall tickness and other measurements requiring contact. The above objectives are complex but can be achieved by using the very relevant previous results of the research team that has pioneered the aerial robotic manipulation and play a leadership role in this area and its applications to inspection. The ARM-EXTEND system will be able to perform contact and non contact inspection in energy generation plants decreasing dramatically maintenance costs and avoiding contamination due to leakages or even explosions due to gas losses. The project will perform experiments in pipe inspection an maintenance, which is a very relevant activity with a huge economic impact. IDRON: Inspection System in confined spaces through the UAS usage. Indoor autonomous system without GPS and without pilot. Mission systems to reduce the dependence with communication systems. Reliable security system with risk plans to face possible hardships. AEROMAIN: Sistema de manipulación mediante robots aéreos para el mantenimiento en la generación y distribución de energía. Aplicación a los aerogeneradores. AEROMAIN proposes the development of the worldwide first aerial robotic system with advanced manipulation capabilities to be applied in inspection and maintenance of energy systems and particularly in the maintenance of wind turbines, including contact inspection (i.e. ultrasonic inspection) and blade repairingof surface damagesor even “materials lost” of impacted areas (leading edge). These operations are today very costly and performed manuallyin risky conditions with experts that have to climb, using for example a rigging system, to inspect specific areas and to perform repairing. The application of crawler robots with magnetic wheels does not solve the problem because the blades of many new wind turbines are made of composites and the crawler should be deployed and maintained. The proposed aerial robotic manipulation system will avoid the above problems providing the capability of flying and performing not only visual inspection but also contact inspection and repairing. Then, the technical objective of AEROMAIN is design and development of a multi-rotor platform that can fly and manipulate with the coordinated motion of two arms for repairing applications where it is not possible to grab and dock to the structure. The two arms are required for two hand manipulation, to provide a fixed contact point while manipulating with the second hand,and to locate a camera or other sensor in an appropriated visualization position for manipulation with the other arm. This objective includes the development of perception functionalities for mapping, positioning, obstacle detection and active cooperative perception. Also includes motion planning for efficient and safe grabbing and manipulation, torque compensation, as well as reactive behaviours to increase safety. The above objectives are very challenging but can be achieved using the results obtained in the very successful FP7 ARCAS on aerial robotics cooperative assembly system, coordinated by the AEROMAIN coordinator,that has demonstrated the first manipulation in the world with helicopters and multi-rotors with 6 and 7 Degrees of Freedom (DoF) arms, including industrial arms. In this project the basic control, perception and planning methods for assembly by means of aerial robots have been developed and appliedto bar grasping and structure assembly. These results open a unique opportunity to produce step changes in aerial manipulation required for achieving relevant industrial results in inspection and maintenance of energy systems and particularly in the maintenance of wind turbines in Spain, that has been identified as an extremely promising application with more than 20,000 wind turbinesinstalled and estimated maintenance costs of 400M€per year. The objective of the project is the development of an automatic system for the identification, localization and monitoring of personnel in scarcely structured environments with intense human activity. The system will be used for the monitoring of activities and personnel in a wide range of environments ranging from construction sites and factories up to supermarkets and malls. The system should be robust to support the irregularities and dynamic changes of the scenario conditions and should be flexible to adapt to the needs and particularities of each environment. VICTORIA-GIVE: Autonomous inductive guidance of an electric bus. This project in the framework of the INNTERCONECTA Vehicle Initiative Consortium for Transport Operation & Road Inductive Applications (VICTORIA) is focused on the design and deveopment of an autoguided system for an electric bus. The system will guide the bus through a set of buried coils that will recharge the bus batteries inductively. In 2013 the functional specifications, the design of the navigation algorithm and the system architecture have been completed. The system will be implemented in a TECNOBUS Gulliver U520 ESP bus. PI-1169/2013, funded by Navantia, S.A. This project is carried out in the framework of the INNTERCONECTA Command and control for interoperability of unmanned systems (CITIUS). In this period a parser for the C-BML language has been developed. This language allows the definition of different multi-purpose missions. In particular, four missions of interest in naval applications have been defined using this language. The C-BML parser has been integrated in the command and control station in order to automatically generate the corresponding sequence of commands for these missions. On the other hand, the interfaces between the command and control software and different types of autonomous vehicles have been also defined. These interfaces have been tested in a mosaic generation mission with an autonomous aerial vehicle over an area close to the Engineering School of Seville. NAVGROUND: Navigation System for an Unmanned Ground Vehicle. The main goal is the design and development of an unmanned ground vehicle and its integration in a system with multiple unmanned vehicles in the framework of the INNTERCONECTA CITIUS on the command and control for interoperability of unmanned systems. In 2013 the main activities were the functional specifications, the requirements of the onboard devices, the selection of components and the design of the whole system architecture. The ground vehicle is based on an electric Hummer HX platform. PI-1203/2013, funded by TTI Norte S.L. In 2013, the first project year, AICIA activities were focused on analyzing the specifications of the communication system and in the analysis of the MANET routing protocols in order to select the most suitable one for the project needs. Riveting involves pre-drilling both parts with adequate accuracy for the later insertion of the rivet. The precision in the positioning hole is critical to the process. At present there are fixed riveting automatic or semiautomatic machines in the aircraft industry, but lack the versatility to accommodate different positions of the airplane surfaces and in real time. Moreover, the economic cost of these machines makes unfeasible the use of different machines for riveting simultaneously in different parts or airplane surfaces. This project aims to design a robotic machine for flexible riveting which is able to adapt to any surface of the aircraft and can be used efficiently in different programs. It will be a portable robotic machine, capable of drilling, insert rivets with interference and sealant applied independently. This machine will be able to locate the rivet points based on information previously given by an operator and navigate to them and do the whole process. Funded by INASOR and EADS-CASA (AIRBUS DEFENCE AND SPACE). FEDER-INNTERCONECTA programme from Spanish CDTI, funded by AIRBUS and APPLUS. PI-0986/2012. The ROBINTER project aims to design and develop a robotic system that can move autonomously or teleoperated, developing inspection work, primarily visual, in tight spaces. This task is mainly to avoid human presence in these areas due to the high risk involved for both individuals and the airframe. AICIA participation in the project is the study, modeling, simulation and development of a control system that allows the robot to move correctly inside various aircraft structures. Also AICIA participates in the study and development of path planning algorithms for obstacle avoidance during movement of the robot. The work also includes the design of the human-machine interface (HMI) for the operator to control the robot. Funded by APPLUS and EADS-CASA (AIRBUS DEFENCE AND SPACE). Funded by the Spanish Ministry of Innovation and Science, belonging to subprogramme Fundamental Unoriented Research Projects within the National Program of Fundamental Research Projects in the VI National Plan for Scientific Research, Development and Innovation 2008-2011. The main objective of this project is the research, development and implementation of a system with cooperative aerial and ground robots for the performance of large and very large endurance missions involving automatic recharging of batteries or refuelling. The system will integrate two different approaches: 1) application of a cooperative system with multiple robots in such a way that functionalities can be maintained while some of the robots recharge batteries or are refuelled; and 2) apply innovative technologies for refuelling or recharge batteries. In this coordinated project the two approaches are combined. Following the approach 1) new cooperation methods involving aerial and ground robots will be applied to maintain long endurance missions in indoor and outdoor scenarios. This approach involves high accuracy landing for automatic refuelling or recharge batteries, including the landing of aerial robots on ground robots, and the use of a tether from the ground robot to the aerial robot. This objective also includes the development of new methods for range only positioning and simultaneous localization and mapping (SLAM) and methods for the planning of the cooperative missions. This approach will be the subject of Subproject 1 to be developed by the University of Seville. The approach 2) consists on the design of an ultra light unmanned aerial system (UAS) with long endurance by means of the application of the laser beaming technology for in flight battery recharging. This approach will be the subject of the Subproject 2 to be developed by the Centre for Advance Aerospace Technologies (FADA-CATEC). PI-0983/2012. Programa FEDER-INNTERCONECTA del CDTI, financiado por Airbus Military. This project is focused on the automatic operation of the circuit breakers that power the airplane primary systems. These devices are operated frequently during the functional tests that verify the integrity and functionality of the airplane subsystems. In 2013 two different solutions have been designed for the A400M transportation aircraft and the development of both of them has started. The first one is a cartesian vertical robot while the second is a vertical 3-arms SCARA robot. Funded by EADS-CASA (AIRBUS DEFENCE AND SPACE). The main goal of this project, carried out in the framework of the INNTERCONECTA ADAM on the Mobility Automation, is the study and development of control algorithms for the ship dynamic positioning problem. Non-linear controllers based on passivity and thruster allocation algorithms based on optimization and quadratic programming have been implemented during 2013. Extensive simulations have been carried out to validate the proposed techniques, using changing environment conditions (wind, current and waves) and considering uncertainties in the ship parameters. The objective of the Futurassy project is the application of robotic systems in manufacturing and assembly lines of carbon fiber components in the aerospace industry. AICIA participates in the “Airbus Standard Robotic Cells,” consisting of the development of standard solutions for process automation of aircraft assembly using industrial robots, which should have low implementation cost, and be flexible, multi-functional, autonomous and efficient. In this line anthropomorphic robots and peripheral technologies are being used for drilling and countersinking of different types of composite materials. AICIA participation focuses on modeling and calibration of industrial robots using different methods to increase the precision of the positioning of the robot tool when stresses are applied, which is required for drilling and countersinking of structural aircraft parts. AICIA is also in charge of the robot controller adaptation. The Futurassy project is led by AIRBUS Operations supported by Corporación Tecnológica Andaluza (CTA) and the participation of research centers, including AICIA. This project is carried out in the framework of the INNPRONTA PERIGEO which is developing a research platform for new space technologies to be tested experimentally in unmanned aerial vehicles (UAV), and subsequently transferred to future space programs. The project aims to develop an infrastructure to investigate technologies that may be promising for space programs and are now not used because they are considered very risky and there is no way to test in normal environments. PERIGEO focuses its research on solving technological challenges of space missions in four scenarios: the observation of the Earth, the interplanetary flight in proximity to celestial bodies (asteroids, comets …), the atmospheric flight, and safe and accurate descent and landing for planetary exploration. One of the main research areas of the project is the fault-tolerant flight control systems for space applications, to ensure a high level of performance and reliability. GRVC AICIA works on developing systems for fault detection and reconfiguration in systems of multiple spacecrafts. Deimos Space leads the PERIGEO consortium, also involving several companies and research centers, among which is AICIA. This Project is carried out in the framework of the INNPRONTA ADAM, on Mobility Automation, led by Boeing Research and Technology Europe. Flight intent refers to the information which describes the trajectory to be flown by an aircraft considering the operational context in which the flight takes place and the user preferences to be fulfilled along the whole trajectory. In previous work, the set of rules which ensures the generation of valid instances of flight intent was structured as a formal language, the Flight Intent Description Language (FIDL). The work in this project of GRVC AICIA extends these concepts to a higher level of abstraction, the mission level. In this period, the architecture and tools used to generate flight intent from the mission intent have been developed and tested. The planner designed in the previous period has been further developed to include geometric reasoning and optimization. On the other hand, specialized planners for surveillance and 3D map generation missions with aerial vehicles have been designed and developed. Funded by Boeing Research & Technology Europe (BR&TE) in the framework of the CDTI Spanish INNPRONTA program. The objective of the project is to develop a robotized inspection system for the inspection of cauldrons of combined cycle power plants and for the detection of steam leaks. The contribution of AICIA focuses on the development of the perception system of the robot, and techniques for inspection and the automatic detection and localization of steam leaks. AICIA also participates in the design of the robot. Funded by ITURRI Group and the Corporación Tecnológica de Andalucía. The objective of the project is to develop an advanced Extrahospitalary Emergency System. The project addresses the design of the vehicle including the chassis as well as its components in order to optimize the in situ diagnosis, treatment and surgery. The development of basic and advanced vital support units is also considered in the project. The main goal of this project is the design and development of technology for the automation and remote control of commercial ground vehicles. Work in 2008 has been focused in the automation of the functional prototype vehicle, a Bobcat 2200 model. Several actuators have been designed and implemented: hydraulic actuators for the steering and braking systems and electric actuators for the accelerator, parking brake and gears. A communication protocol and teleoperation station have also been designed and developed. Communication between the vehicle and the station can be performed using a wireless link or fiber optic cable. Funded by the Spanish Ministry of Education and Science, Proyectos Singulares y Estratégicos, PLATINO Programme, PSE-370000-2009-13, and the Fondo Europeo de Desarrollo Regional (FEDER). The main objective of the SATA project is to develop a system that allows fully autonomous landing of aircrafts, particularly helicopters, in static and moving platforms. Particularly, SATA is devoted to the development of technologies for landing of Unmanned Aerial Vehicles (UAV) focusing the design and development of a system for the landing of autonomous helicopters in ship decks. The system should be able to operate in different weather conditions, day and night and in any location. The AICIA team develops research and development activities on autonomous landing by using on-board sensors to estimate the relative motion, position and orientation between the UAV and the landing platform. Particularly, computer vision techniques, by means of real-time image processing on-board the helicopter, are applied. First, a reliable interest point detector will be necessary. Those points can be computed based on segmentation together with known patterns to increase the reliability of the system. Once detected such points, relative position and orientation can be estimated based on homography techniques. These estimations should be fused with the ones obtained by means of other on-board sensors, including range measurements and differential GPS, to increase the reliability. The AICIA team also works on the design of landing control laws taking into account the dynamic model of the helicopter and the model of the platform motion. Then, the team is working on helicopter modeling, and on the analysis of different control methods. A method based on internal model and trajectory planning taking into account the helicopter motion constraints has been proposed. The on-board control system should be able to identify in real-time a suitable model of the platform motion to be synchronized with the helicopter motion. Funded by Regional Government of Junta de Andalucia. Excellence Projects 2007. The main objective of the project is to research and experiment distributed perception techniques by integrating multispectral cameras and wireless sensor networks. The goal is to develop perception techniques that integrate results from visual cameras, infrared cameras with perceptions obtained from sensors installed in wireless sensor network nodes. The resulting integrated perception will allow to detect, localize, extract features and track mobile objects in non-structured scenarios. This perception will be reliable in adverse illumination and weather conditions. The techniques will be demonstrated for the monitoring of traffic and detection of risky situations such as traffic accidents. They will also detect aggressive driving. Funded by Ministerio de Industria, Turismo y Comercio, programa PROFIT-Ayuda a centros tecnológicos a través de proyectos consorciados. ROBAUCO Project proposes new basic technologies for the development of autonomous, mobile and cooperative robots in order to carry out complex tasks. Development of technologies to obtain mobile robots in charge of complex tasks requiring a high autonomy level and the ability to cooperate with human beings. Development of new and more efficient human-robot interactions. A perception system based on data fusion from different sources. Development of a framework to integrate perceptive and cognitive systems in mobile platforms (aerial and terrestrial). Results validation for fire extinguishing. 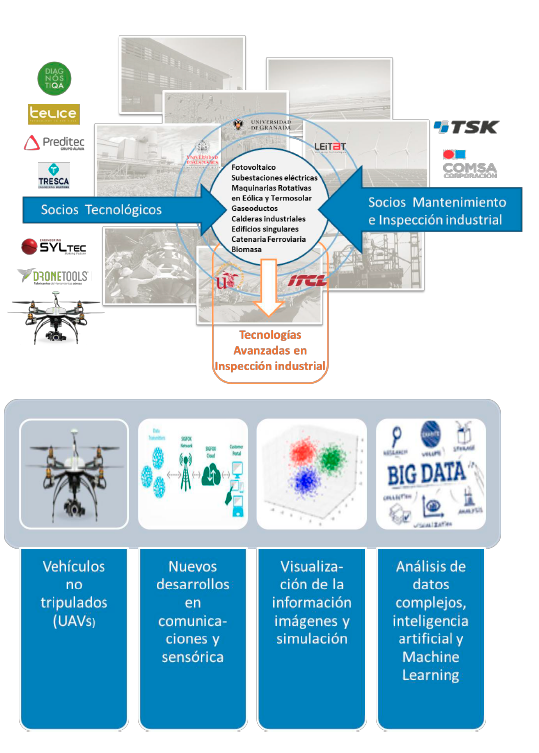 ATLANTIDA: Application of Leading Technology to Unmanned Aerial Vehicles for Research and Development in ATM. Funded by Boeing Research & Technology Europe (BR&TE), in the framework of the CENIT programme. The ATLANTIDA project, within the framework of the CENIT programme, is an ambitious R&D project directed to the research on the necessary elements for a drastic change of the ATM in Europe and the world. The project is focused to the development of technologies that can make the necessary change in the present paradigm of management of the aerial traffic, characterized by a low level of automation and is based fundamentally on tactical decisions taken by humans. Thus, to face the challenges of capacity and efficiency which it faces, the ATM of the future will operate more strategically and will be highly automated. The work of research of ATLANTIDA will be directed to explore the limits of the automation of the management of the aerial traffic and to generate the knowledge necessary to increase the degree of automation in ATM with safety and efficiency. Particularly, the greater challenge for the automation in the future ATM system, in which ATLANTIDA will be concentrated, is the management of trajectories of aircrafts. The main objectives of the ATLANTIDA project are: 1) to develop a rigorous scientific-technical approach to introduce a high degree of automation in Aerial Traffic Management (ATM), 2) to research its behaviour in laboratory conditions, with the help of unmanned aerial vehicles, and 3) to analyze the extrapolation of the approach developed to real context ATM. Boeing Research & Technology Europe (BR&TE) heads the ATLANTIDA consortium, in which other 16 companies leaders in the aerospace and information and communications technologies sectors participate: Indra Systems, Atos Origin, TCP Systems and Engineering, GMV Aerospace & Defense, Altran Technologies, North TTI, Aernova Engineering Solutions, INSA (Aerospace Engineering and Services), Aertec Engineering and Developments, Indisys (Intelligent Diallogue Systems), Intergrasys, Aerovision Air vehicles, MDU (Militärtechnologie Dienst Überwachung), ISdefe (Engineering and Systems for the Defense of Spain), Catón Alternative Systems and Iberia Airlines of Spain. The partnership includes the collaboration of 16 outstanding public research and development Spanish organisms, with AICIA among them. ATLANTIDA: Development of the Flight Manager and technologies for the accomplishment of tests. Funded by Aertec Engineering and Developments, in the framework of the CENIT program. The ATLANTIDA project is an ambitious project I+D directed to the researching of the necessary elements for a drastic change of the ATM in Europe and the world that is within the framework of the program CENIT. Project ATLANTIDA sets out to explore an automated approach to aerial traffic management applicable without solution of continuity to any scene of operation of air vehicles, including the conventional aviation, the civilian and military applications of UAVs, the operation of VLJs and the future systems of personal aerial transport. Boeing Research & Technology Europe (BR&TE) heads the ATLANTIDA consortium, in which other 16 companies leaders in the aerospace and information and communications technologies sectors participate, among them is Aertec Engineering and Developments. AICIA collaborates with this company in the automation of the Flight Manager (FM) and in the development of technologies for the accomplishment of tests. Teleoperation Interfaces for UAV Control Stations. Funded by Boeing Research and Technology Europe in the framework of the CENIT program. This project has examined different technologies that can be applied in the design and development of a ground control station for Unmanned Aerial Vehicles (UAVs) equipped with a multimodal interface. Multimodal interfaces are interfacing technologies that employ multiple sensory channels/modalities for information transmission as well as for system control. Examples of these interfacing technologies could be head-coupled images/Head-mounted displays (HMDs), haptic feedback technology, head tracking, auditory information (spatialized audio), voice control, tactile displays, etc. The applicability and benefits of those technologies have been analyzed for the control of a single UAV, but their possible extension to a control station for several UAVs have been also considered. ROBOCA: Research on Robotic Inspection Systems for the Detection of Steam Leaks in Combined Cycle Cauldrons. Funded by Iberdrola Generación SAU and la Corporación Tecnológica de Andalucía. The objective of the project is to develop robotic systems for the inspection of cauldrons of combined cycle power plants and for the detection of steam leaks. The contribution of AICIA focuses on the development of the perception system and techniques for the automatic detection and localization of steam leaks. AICIA also participates in the design of the robot. This project continues the development of a system to manage and execute the A400M Functional Tests. These tests verify the integrity and functionality of the airplane subsystems while assembling and it is a previous step to the first flight of each unit. Functional tests for the electrical and fuel systems have been designed and developed. The simulators for several AIMs (Aircraft Interface Module) involved in those tests have also been designed and implemented. Funded by PROTEC FIRE, from ITURRI Corporation. The objective of the COVE project is the design and development of a communication system for a special purpose vehicle dedicated to fire fighting. This communications system must connect the control module and human-machine interface of the vehicle with the various elements of it, including chassis, engine, electrical system and special items. Funded by Ministerio de Ciencia e Innovación, convocatoria de Proyectos Singulares y Estratégicos 2008, Programa PLATINO, PSE-370000-2008-9. HADA is a vertical takeoff and landing (VTOL) aircraft convertible in flight, capable of taking off, landing and hovering as a conventional helicopter, and flying on cruise regime in fixed-wing aircraft configuration with high efficiency. The configuration change from helicopter mode to airplane mode is achieved through mechanisms that make the deployment of the wings and the folding of the main rotor blades. At the same time, there is a transfer of power from the main rotor to the tail propeller. The initial prototype will be a UAV for surveillance and security missions. The next development will be a passenger jet for regional transport. The HADA project is led by INTA, and involves several companies and research centers in Spain. The GRVC participation focuses primarily on the area of navigation, guidance and control, and modeling and simulation of the transition phase. Funded by Technological Corporation of Andalusia and PROTEC FIRE, from ITURRI Corporation. The overall objective of the PROMA project is the design, development and testing of the control system of a special purpose vehicle dedicated to fire fighting. These vehicles are produced in small series according to customer specifications, and therefore the control system must be very flexible and easily modified. One of the main functions of a fire fighting vehicle is to provide adequate flow and pressure of water or foam used to extinguish the fire, maintaining a constant outlet pressure although at any given time output valves are opened or closed in the system. The PROMA control system should be responsible for this function, as well as management and communications of all systems in the vehicle, including chassis, engine, electrical system and special elements, among others. Also included is the human-machine interface that allows efficient use of the vehicle by fire fighters. The objective of PROTEC-SENS is to develop and validate a system for fire fighters protection based on the use of Wireless Sensor Network technology with mobile nodes. Based on the WSN technology, the nodes equipped with sensors, information processing capabilities and communication capabilities will be integrated in the fire fighters costumes. The information gathered by the nodes will be sent to a centre station, which will allow implanting strategies for fire extinguishing optimizing the protection for the fire fighters. The system and functionalities will be demonstrated in controlled urban fires that will be performed at ITURRI facilities. In aquaculture sector there is a need of systems capable of estimating the weight and size distribution of populations of fish species. Commercial systems have limitations. Some systems involve strong human intervention. Others require aditional hardware elements, which involves difficulties when dealing with fish farms with cages in the open sea. The Robotics and Computer Vision Group (GRVC) has developed a fully automatic system for the estimation of weight and size distributions of aquaculture fish species using a stereo vision system. The system is capable of operating in fish farms with cages in the open sea without any adaptation or any other hardware element. The objective of the project is to test the prototype developed by GRVC and to evaluate its performance in industrial operational use. As specific objectives, the system will be evaluated for semi-automatic estimation of sea bass and for fully automatic of gilthead bream. This project is part of the design and development of a system to manage and execute the A400M Functional Tests. These tests verify the integrity and functionality of the airplane subsystems while assembling and it is a previous step to the first flight of each unit. The main goal of this project is the design and development of a simulation tool. The simulations developed with this tool are embedded and executed in the AIMs (Aircraft Module Interface) under a SEAS3 environment; this simulation performs the software interface between the aircraft and the test system. A SEAS3 emulator has also been developed to validate simulations before being embedded in the AIMs. SADCOM. Distributed and autonomous systems to preserve natural environments. Funded by Junta de Andalucia. Excelence project 2005. TEP-375. This project aims at the development of distibuted and autonomous systems technologies for the preservation of natural environments. The application of wireless sensor networks and autonomous vehicle technologies for three important cases will be studied: flora (1) and wildlife (2) monitoring and tools for forest fire fighting (3). Funded by the Dirección General de Investigación. DPI2005-02293. 2005-2008. The project aims at the development of a system based on the use of aerial and ground robots and sensor networks for cooperative perception. The system is based on the joint application of Aerial Robotics and the technology of Wireless Sensor Networks. Several autonomous and teleoperated vehicles will be used including an helicopter previously developed by the Research Group and an autonomous airplane to be developed in the project from the adaptation for autonomous operation of a small unmanned commercial airplane. The helicopter manoeuvrability and hovering capability will allow reaching locations with constrained accessibility, collecting information and communicating with the on-ground sensors. The airplane will provide larger exploration range and velocity communicating with an on-ground mobile station. The information provided by the sensors on the vehicles and on the ground will be processed by the cooperative perception system to be developed in the project. This system will be designed taking into account redundancy and reliability criteria on the information provided and the trajectory planning of the aerial and ground vehicles. Funded by Junta de Andalucia. Excelence project 2006. The general objective of the project is the design, development and experimentation of a platform providing the functionalities required for the cooperation among UAVs (Unmaned Aerial Vehicle) and among these ones and others devices in the environment like sensors, actuators and human interaction devices. The platform will enable the operation in sites with difficult access and without communications infrastructure. Particularly, the project considers the integration of mobile robots, wireless sensors (including mobile sensors carried by people or vehicles), actuators with wireless communications and devices such as computers and PDAs with proccesing capacity and human interaction. Funded by the Dirección General de Investigación. DPI2002-04401-C03-03. Project Coordination. University of Malaga and Vigo also take part in this project. 2003-2005. The main objective of the CROMAT project is the development of new methods and techniques for the cooperation of aerial and ground mobile robots. It is intended to develop technologies that could be used in applications such as inspection of utilities, infrastructure and large buildings, disaster detection and monitoring (fires, floods, volcano eruptions, earthquakes), exploration, surveillance, urban safety, humanitarian demining. The project also intends to contribute to the development of the aerial robotics, which is a field that will have an important development in this decade, fuelled by the progress in Microsystems, with many new applications. Taking into account the objectives and activities to be developed in the project, CROMAT is a coordinated project with three Subprojects that share a common Workpackage devoted to the design and development of a new control architecture for the coordination of aerial and ground mobile robots. The first Subproject, leaded by the University of Sevilla, is devoted to the development of a platform for aerial robotics based on a RC helicopter and its integration with a ground mobile robot. The second, leaded by the University of Malaga, deals with teleoperation and cooperation of mobile robots, and the third Subproject, leaded by the University of Vigo, is devoted to the development of helicopter control techniques. The above figures show the three robots involved in the CROMAT demosntration experiments and coordination. Funded by the Consejería de Empleo y Desarrollo Tecnológico. Junta de Andalucía. Convocatoria de ayudas para los Agentes Tecnológicos Plan Director de Innovación y Tecnología (PLADIT 2001-2003). 2003-2005. 1) Development of innovative computer vision and image processing techniques to estimate position and heading of interest objects, obtain automatic thermographies and achieve the fusion of infrared and visual infomation. 2) Development of telerobotic techniques that simplify helicopter teleoperation to perform the above-mentioned inspection tasks, including autonomous hovering. The general objective is the development of a system that allows to estimate automatically the distribution of fish size and the number of fish in a sea cage. The system should also provide parameters for monitoring of sea cages and for characterising the behaviour of the fish population. estimation error lower than 5%. 3) To develop new methods for monitoring inside the sea cages capable of providing automatically parameters of the fish such as features of fish motion. 4) To develop devices capable of implementing the previous techniques. Particularly, the objective is to use light portable devices that can be easily carried at the sea cage. In order to obtain higher information of the state of the sea cage, more than one stereo-vision system will be used. Funded by IZAR-FABA and “Gerencia del Sector Naval” from the Ministry of Science and Technology. The objective of the project is to research in electro-optical systems for ship navigation help. Particularly, artificial vision and image processing systems are being developed for applications of automatic visual tracking and stabilization of sequences of images. The project researches in new techniques of multi-object visual tracking highly robust to disturbances. New multi-window tracking systems based on grey-level correlation are being tested. For the stabilization of sequences of images, new frequency-domain techniques are being developed such as those based of Fourier-Mellin transform. All the elements and systems of an airplane undergo a series of exhaustive test during their manufacturing, assembly and in the periodical revisions. The CATS project involves the design and development of a system that allows to automate the whole process of test design and edition, as well as their management and execution. The sytem allows to carry out tests of avionics and other mechanical and electrical systems. Currently it is being used for the execution of flight controls, weight measurement and engine parameter sensing. Test specification is easily done with the help of an specifically created language, ATVL. It provides communication capabilities through RS 232, RS 485, Ethernet and ARINC 429 bus, as well as input and output of analog and digital signals. In addition, it allows to access in a simple way the information contained in the different communication messages, thanks to the use of processing templates. It also offers a great variety of graphical primitives for the display of the relevant variables or parameters during test execution. CATS also includes a visual editor that eases the edition of test files. The CATS system performs in an automated way the access control to different privilege levels, and the management of all the information generated during the tests. This allows the automated generation of reports and statistics from the obtained results. Funded by Instituto Andaluz de Investigación y Formación Agraria, Pesquera, Alimentaria y de la Producción Ecológica. 2004-2006. The general aim of the project is the development of a system that estimates the distribution of sizes and the number of fish wallowing in marine cages in an automatic way, it also calculates some parameters that allow to monitor the state of the cage and to characterize the behavior of its population. In particular, new methods are being developed that, applying stereo vision methods, allow the totally automatic and highly reliable estimation of the global distribution of sizes of the fish wallowing in marine cages, without the necessity of manipulating the above mentioned fish, which would make them stressed and alter the reliability of the estimations. Besides we obtain some parameters such as the speed of the fish and some characteristics of their movement, the existence of pollutant substances in the cages, … that allow to monitor the interior of the cages. In addition new methods are investigated based on the union of computer vision and ultrasound technologies to obtain an estimation of the total number of existing fish in a marine cage. Finally we develop the equipments that allow to implement the technologies previously explained. The research group developed a robot to shake biosolids in the framework of the project “Solar drying system of biosolids in purifying stations for sewage water (SSB)”. In the project SSB, a solar drying system of biosolids was developed. The system consists of a greenhouse with mechanic ventilation, whose management depends on the operation conditions and with an optimal system for the shake of the mud by means of a robot which favours the drying process. This research group focused on the robot to shake biosolids and the work consisted in the development of the control system and the communications system. Also, it was developed the high and low level software. The robot has been showed successfully in a drying biosolids factory property of EMASESA. The general objective of this project is to enhance and improve the functionalities of the system for navigation aid developed in SEOAN project. Image processing and artificial techniques are being developed for fusion of images and data as well as for robust tracking of multiple targets. Particularly, a system for tracking of targets in infrared and visual images robust to changes in lighting conditions and occlusions of the target is being developed. Automatic fusion of infrared and visual images is being researched. The application of new techniques based on Fourier-Mellin transform are being researched for the automatic correction of translations, rotations and scaling between images, for the automatic fusion of infrared and visual images as well as for the stabilisation of sequences of colour images. Investigation project based on the book “Robótica: Manipuladores y Robots Móviles” and on the use of the tool package known as “HEMERO: Herramienta MATLAB-Simulink para el estudio de manipuladores y Robots móviles”. Develop by Jesus Ivan Maza y Aníbal Ollero. The web site could be use for executing some examples of the book without the need of installing or having any specific software on the client´s PC. And it is posible to see some robots in a tridimensional model. In the future, a client will also be able to control (by login in as a user on the Web site), some robots that are on the laboratory of the department of Systems Engineering and Automatic Control on the University of Seville. Funded by the INSTITUTO NACIONAL DE TÉCNICA AEROESPACIAL. TriboLAB is one of the instruments selected by ESA to be placed into the European Technological Exposure Facility (EuTEF) which is part of one of the International Space Station (ISS) at one of the external balcony of the European Columbus modules. The purpose of TriboLAB is to perform basic and applied tribological experiments to study the behaviour of lubricants and typical space mechanisms in the space environment. TriboLAB will carry out three types of tribology experiments: Pin-on-Disk (POD), Ball Bearing (BB), and Labyrinth Sealing in Effusion Cells. It will allow to evaluate the tribologic performance of a coating (POD) and to test the typical elements of a mechanism (BB, sealing systems). The TriboLAB on board software, named Tribotester, is being developed by the Instituto Nacional de Técnica Aeroespacial (INTA) as part of the TriboLAB Control Computer. Software requirements specification for the the Instrument Station Software. Implementation of a prototype of the Instrument Station Software. The Tribotester HLSW is responsible for initiating and finalising the experiments, controlling the executions, monitoring the environmental conditions of the instrument, processing the data from the force sensors and transferring the processed data to EuTEF, which is then responsible for sending the information to ground. The Instrument Station Software is responsible for managing the execution of the experiments by TriboLAB Instrument as well as for storing and processing scientific data sent by TriboLAB Instrument. Furthermore, it shall monitor the state of TriboLAB Instrument. The participation of AICIA in TRIBOLAB is funded by the INSTITUTO NACIONAL DE TÉCNICA AEROESPACIAL. Figure: Columbus module of the International Space Station. New perception techniques for detection and tracking using infrared and visual cameras. Funded by the Comisión Interministerial de Ciencia y Tecnología. (CICYT), FEDER. 1FD97-0566. 1999-2001. The objective of this project is the development of new perception methods for efficient real-time detection and tracking of objects using as sensors infrared (IR) and visual cameras, as well as the combination of both by means of data fusion techniques. The project address some existing problems of the current detection systems due to the variations of the conditions in natural environments and the definition of appropriated detection thresholds. The project also considers the development of new techniques for False Alarm Reduction (FAR). Furthermore, new tracking methods which can deal with temporal occlusions of objects and simultaneous tracking of multiple objects are being researched. The robustness of the detection and tracking techniques against noise and variations of the environment conditions will be pursued. The project will also consider the research in new control techniques to perform efficient detection and tracking decreasing the mechanical requirements in the cameras positioning system and then reducing the cost. A prototype to demonstrate the performance of the developed methods in several applications in natural environments is being developed. Particularly, the project considers applications to Environment Protection and Surveillance, including forest fire detection. Potential applications are also obstacle detection and surveillance in naval environments. Positioning system with infrared and visual cameras. Funded by the Comisión Interministerial de Ciencia y Tecnología. (CICYT), FEDER. 1FD97-1416. 2000-2001. Aquaculture is growing very fast (near 15% per year), with productions of about 20 million tons per year produced in about 200.000 ponds or cages, which represent 20% of the world fisheries requirement. The main objective is the improvement of the production process in fish farms using new perception and control technologies. All the phases in the fish growing process are involved, as well as the sizing, quality control and grading. Special attention will be paid to the following operations: (1) Estimation of the number and size distribution of fish in ponds under thermal cover and inside buildings; (2) Estimation of the number and size distribution of fish in large earthen ponds and cages; (3) Inspection and classification; and (4) Development of a distributed computer system for the intelligent control of the fish farm integrating the estimation and classification systems mentioned above and also diagnostic systems and multivariable control systems to improve the quality of the product and the safety against perturbations and fails in components and equipment. Mobile robotics with articulated elements. Funded by the Comisión Interministerial de Ciencia y Tecnología. (CICYT), TAP99-0926-C04-01. 1999-2001. This project aims the development of new methods and technologies for the control of mobile robot with articulated components. Both articulated vehicles, and conventional vehicles with on-board articulated elements are included. The project considers several different articulated elements from relative simple devices (pan & tilt systems for camera orientation, fork and lift devices) to articulated arms. The Project integrates four different Subprojects. The first one considers mobile robots with multi-joint elements and their applications in forestry, heavy vehicles guidance, and exploration. The Subproject 2 is devoted to the control of articulated autonomous vehicles. Subproject 3 has a more fundamental approach, by considering control theory methods in trajectory tracking and maneuvering with uncertainties in the models. Finally, Subproject 4 is devoted to articulated vehicles for exploration. This projects allows to take profit from the results of the previous CIRO project, extending its results to articulated vehicles and to vehicle with on-board articulated elements, considering the involved theoretical problems, and studying different relevant applications in the mobile robotic domain. Thus, it is intended to solve the theoretical and practical problems that arise from the applications in this domain. Founded by Ministerio de Industria, Programa ATYCA y FABA-BAZAN, 1999-2001. Desing and Development of a sensor to early detection of forest fire. The sensor includes a new Infrared detector, optics, electronics circuits, communication and software. The SEATAP-JM system estimates the distribution of sizes of fish wallowing in sea cages in such an automatic way that makes unnecessary the manipulation of the fish or the alteration of the conditions of the cage, making easier the tasks of sampling, and avoiding simultaneously the stress that the above mentioned tasks suppose for the fish. As a consequence the tasks of sampling cages might be done with greater frequency and the results obtained have a better reliability. This is achieved using computer vision and image processing techniques. In particular we have developed a stereo vision system, composed by two cameras in a submersible housing that is dived in the cages, acquiring images that are processed in a computer system, where they go through a series of algorithms that obtain in an automatic way, without needing the intervention of an operator, measurements of the average weight of the fish in the sampled cage. Funded by Sociedad Sevilla Siglo XXI.1998-2000. The research has focused in methods for the application of robotics and automation technologies in processes of alimentary industries. The application of robotics for the improvement of agricultural machinery has also been addressed. Finally, the research work has included the application of telecomunication and information systems to the improvement of traditional machinery. The goal is development of computer tools to facilitate the design of fuzzy control systems for environment protection. Funded by Pescanova, S.A. and ATYCA Programme of the Spanish Industry Ministry. 1998-1999. The objective of this project is the design and development of a machine to estimate the volume and weight of the fish using optical methods. Particularly, a computer vision technique based on the projection of laser stripes has been designed and implemented. Funded by Sociedad Sevilla Siglo XXI (Diputación de Sevilla). 1998-1999. The research has focused in a system for disaster prevention, information and communications systems for help in forest fire suppression, and vision systems for quality control. Perception systems for false alarm reduction. The goal of this project is to improve the BOSQUE system by adding a system of detection of false alarms. The new system integrates iinfrared and visual mage processing techniques, as well as terrain maps and heuristic information. It also includes multitarget detection techniques. In the project, computer vision techniques and range sensors are used to determine the number, size and shape of individuals of different species in various growth stages. Image acquisiton is performed both from outside and inside the tanks. Autonomous driving of large vehicles. Funded by Neumáticos Michelín, S.A. 1997-1999. New methods for outdoor position estimation and automatic steering of large vehicles are developed in this project. These methods are being implemented in trucks driving autonomously on test tracks. Differential Satellite global positioning (DGPS), navigation sensors (gyroscopes, compasses, speed sensors) and dead reckoning techniques are employed. Funded by Servicios Forestales, S.L. and Instituto de Fomento de Andalucía. 1997-1999. The objective of this project is the design, development and implementation of a control system for a forest processor machine. The project also includes the design of the robot arm and the vehicle control system. Production control and telecommunications are also included in the project. Design and development of models to predict floods in the Guadalquivir river basin. Dynamic models using fuzzy logic and learning techniques from data collected in recent floods have been developed. The prediction system has been implemented in the “Hydrographic Information Automatic System” of the “Confederación Hidrográfica del Guadalquivir”. Design of wind turbine generator control systems. Funded by Desarrollos Eólicos, S.A. 1997-1999. The objective of the project is the design of advanced control systems for new 650 Kw. wind generators. The project includes the model identification and simulation, the design of control systems comparing several control strategies (PID control with gain scheduling, optimal control, robust control, and fuzzy control) and the testing in the wind turbine generator. Funded by Universidad Internacional de Andalucía, Sede Iberoamericana Sta. María de la Rábida. 1997-1999. Design and implementation of new fuzzy model identification and fuzzy control techniques. Application to biotechnological processes. Intelligent Control Systems for Mobile Robots (CIRO). Funded by the Comisión Interministerial de Ciencia y Tecnología. (CICYT), TAP96-1184-C04-01. 1996-1999. Design, development and implementation of perception and control techniques for mobile robots. New computer vision techniques for tracking and position estimation. Intelligent control based on environment perception. GPS based autonomous navigation. Reactive navigation using lasers and ultrasonic sensors. The project also includes the design and implementation of high performance, stable and robust control systems using fuzzy logic and neural networks. Teleoperated driving and telerobotics were also objectives of the project . Experiments in Romeo 3R and Romeo 4R (see Figure) were conducted in the project. Cooperation Hispano-Austriaca. Colaboration with University of Graz (Austria) in order to develop new technologies related to autonomous vehicles guidance. Funded by Asociación de Abastecimientos de Agua y Saneamientos de Andalucía (ASA) and Ministerio de Industria y Energía. 1996-1998. The main objective is the design of a new system for internal visual inspection of small diameter urban network pipes. the system will include a robot capable of carrying a vision system inside pipes without interrupting the service to the end users. The robot will be able to inspect 100 millimeters diameter pipes and to negotiate right angles and Ts. The control and supervision station will include software to facilitate the inspection and to support several image processing functions for surface observation and measurement. Furthermore, the result of the analysis will be integrated in an expert system for predictive maintenance of the urban pipe-line networks. Miniman: Space Robotic Manipulation Demonstrator. Funded by the Instituto Nacional de Técnica Aeroespacial (INTA). 1992-1995. The main objective of the project was the design and development of a robotic manipulator for Space applications such as the operation in space minisatellites. A teleoperation station has been developed. This station includes virtual image generation, processing of several operator inputs, and autonomous obstacle detection. Applications of fuzzy logic in Robotics. Funded by the Dirección General Interministerial de Ciencia y Tecnología (DGICYT-Ministerio de Educación y Ciencia-). Acciones Integradas Hispano-Alemanas. HA-1995-0145. 1995-1996. Spanish-German integrated actions with Weingaten School of Engineering for the development of fuzzy methods and applications in mobile robotics. The cooperation includes space robots. Funded by the Comisión Interministerial de Ciencia y Tecnología (CICYT), TAP95-1935-E. 1995-1996. The goal is the development of new optical measurement and verification techniques with industrial applications. More specifically, techniques based in laser range finding, structured light and stereo vision will be considered. The applications will mainly focus in aeronautical industries. Outdoor robot navigation in non-structured environments. Funded by the Comisión Interministerial de Ciencia y Tecnología (CICYT). TAP93-0581. 1994-1996. Design and development of autonomous vehicles and navigation systems for outdoor applications such as inspection, surveillance nad transportation. Development ot the Romeo 3R system. In the framework of this project was included the development of prototype robots for planetary exploration in cooperation with the Robotics Institute of Carnegie Mellon University (Pittsburgh, EEUU). Funded by Junta de Andalucía y and Compañía Sevillana de Electricidad. 1994-1995. The main goal of this project is the development of perception and communicacion techniques to be used for the autonomous visual inspection of electric power systems. Mobile robot for greenhouse servicing. Funded by the Instituto de Fomento de Andalucía (PENIC Programme) and FIAPA (greenhouse owner association). 1992-1995. This project was a collaboration with the University of Malaga. A mobile robot has been designed, built and experimented in greenhouses. Special attention was devoted to greenhouse spraying. The robotic vehicle accommodates several devices for inspection and operation. Particularly, an intelligent spraying system with external sensing designed to optimize the chemical treatment has been implemented. Furthermore, the mobile robot does not require adaptation of existing greenhouses. The Aurora mobile robot in a greenhouse (cover of the IEEE Robotics and Automation Magazine, December 1996).